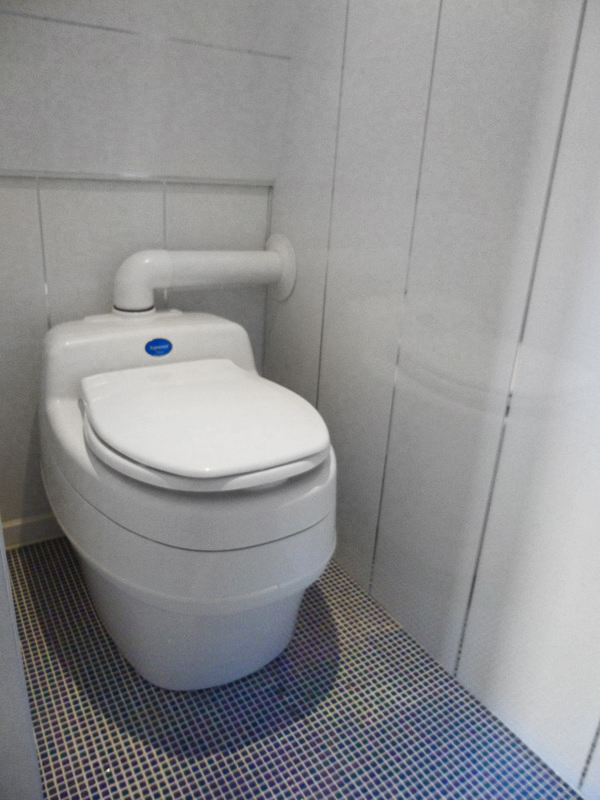 Compostig Toilet - The Tiny House UK "Office". As well as the built in extractor fan, a battery cable is included and a power adapter so the unit can run on normal 230V power. It is supplied complete for simple installation with a venting pipe to run through a wall and a 2-metre long hose for urine waste. An idea option for an off grid Tiny House, Garden Building, Log Cabin or Chalet. The unit is 18″ wide by 21″ deep (45cm x 54cm). The unit stands 20″ high (52cm). these toilets can be used in Tiny Houses, Log Cabins, Garden Buildings, caravans, Boats, in fact anywhere that needs a toilet! The urine can be easily disposed of in many ways – down a drain, in a public toilet even in a hole in the ground (with permission). It can be collected and poured over grass or sprayed over plants. The solid matter is composted in the unit and need only be emptied after a few weeks or months, depending on usage. There is a small fan (12 volt – 0.2A – mains adaptor also included). This draws air over the compost and ensures good drying and decomposing of the waste and extracting the air through a 3″ outlet.